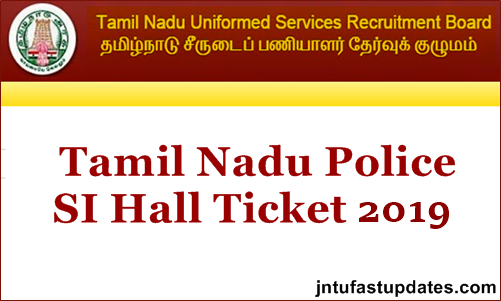 TNUSRB Police SI Technical Hall Ticket 2018: Tamil Nadu Uniformed Services Recruitment Board (TNUSRB) is going to organize the Sub-inspector examination shortly and exam date will publish on hall ticket. This year a large number of candidates have applied for the TNUSRB Sub-Inspector posts. All the candidates applied for the posts have to appear for the test to shortlist for the next rounds of selection process. The organization will conduct the written test in many examination centers across the state of Tamil Nadu. Candidates who are going to compete for the TNUSRB written test must download Tamil Nadu SI Hall ticket to attend the test. The hall ticket will be accessible to download at tnusrbonline.org. candidates can download the admit card and keep it safe to attend the examination. More guidelines, and information regarding TNUSRB Sub-inspector admit card is furnished in this article. Tamil Nadu Uniformed Services Recruitment Board is the state level department that works for the various functionalities. Annually the department releases various notifications to hire the suitable candidates into various designations. It recruits the candidates by conducting various tests based on the recruitment. This year the Tamil Nadu Police SI notification was released for 969 posts. Candidates wishing to become Sub-inspector in the state of Tamil Nadu have applied for the announced posts from in march to april. TNSURB has got a huge number of applications from the eligible and interested candidates. Scrutinizing of suitable candidates will be done through the written test, physical standards test, physical eligibility test, and document verification rounds. Aspirants qualifying in all these rounds will be finally appointed Sub-inspector posts in the state of Tamil Nadu. Candidates applied for Sub-inspector posts in the state of Tamil Nadu have to appear for the written test as per the schedule. Candidates can download Tamil Nadu Police SI admit card before 10 days of the examination. Aspirants can download Tamil Nadu Sub-inspector admit card /hall ticket to proceed with the examination. Strict hall ticket verification will be done by the examination officers. Candidates have to show admit cards and identity proof such as Aadhar card, vote card, PAN card or any others during the verification time. Candidates can check the details of the examination center, date and time of the examination, from the admit card. Candidate’s name, register number, and other details will be printed on admit cards. So, aspirants can check all the details once after downloading the admit card. Go through the examination guidelines that are printed on the admit card before attending the examination. Steps to download TNUSRB Hall ticket are given under. Just follow the steps to download admit card easily. On the homepage, click on TNUSRB SI Hall Ticket 2019.